Apple Music is a music-streaming service, developed by Apple Inc. Users select music to stream to their device on-demand, or they can listen to existing, curated playlists. If you are an Apple Fan, you will like Apple Music as well, which is available on the iPhone, iPad, and iPod touch running iOS 8.4 or later and Apple TV, Apple Watch 1.0.1 or later. You can also enjoy Apple Music on Macs and PCs with iTunes. Apple Music for Android is also supported, so if you are Android users, you still can have a try. Apple Music includes the Internet radio station Beats 1, that broadcasts live to over 100 countries 24 hours a day, and the blog platform Connect, that allows artists to share their posts, photos, videos, and tracks with subscribers. For the new user of Apple Music, it supports them 3-month free membership. After the free 3 months trial, you can decide to subscribe the Apple Music or not. If you don't like the service, you need to cancel the subscription by yourself, else it will be subscribed month by month. It is very simple to use it. There is no additional need for you to download extea software. Only you need to have an Apple ID to pay for the service. Collect all you music files into one place. All your music, no matter where it came from, lives in your Apple Music library. So it gets easy to search, explore, and listen to all of it and find new music. 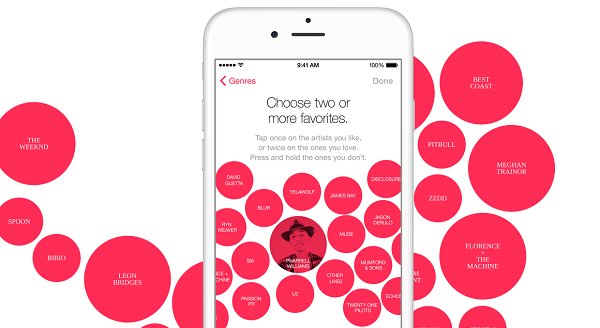 It supports large amounts of music collections in Apple Music catalog. And you can find almost the popular and hot music in it. It also provides music recommendations based on a user's taste, and the iOS application is integrated with Siri voice commands. It supports offline playing. You can downloaded it so as to play and enjoy them offline. Finally Family Plan makes you can easily share music with your Family. It also supports special discounts for student plan. Sometimes, you can find what you need directly. You think you click the right button, you don't go to what you want to go. Not mentions of the amount of bugs. It drains your battery severely than what you think it will. And only with music service, it can't maintain 24h. It looks terrible for the students, which can't find a place to recharge. This takes away the ability for the user to sync music locally and has caused chaos for some users' music libraries. However, the service was praised for its smart functions. Along with the iCloud Music Library feature, Apple Music has been reported to delete original music from user storage and replace it with a DRM-locked version. All the files are DRM-locked. If you don't subscribe Apple Music, any streaming music you've added to your library from the Apple Music catalog will no longer be playable. And you won't be able to stream your previously purchased and uploaded music to your devices. Special Notes: Remove Apple Music DRM. Spotify is a Swedish music, podcast, and video streaming service, launched in October 2008 by startup Spotify AB, that provides digital rights management-protected content from record labels and media companies. It is available in most of Europe, the Americas, Australia, New Zealand, and limited Asian countries and territories. Google Play Music is a music streaming service and online music locker operated by Google. Users with standard accounts can upload and listen to up to 50,000 songs from their personal libraries at no cost. An "All Access" subscription, sold in combination with YouTube Red for US$9.99 per month, entitles users to on-demand streaming of any song in the Google Play Music catalogue for their geographical region and the ability to create custom radio stations. Users can purchase additional tracks for their library through the music store section of Google Play. Tidal is a subscription-based music streaming service that combines lossless audio and high definition music videos with curated editorial. The service has over 25 million tracks and 85,000 music videos. Tidal claims to pay the highest percentage of royalties to music artists and songwriters within the music streaming market. Tidal offers two digital music streaming services: Tidal Premium (lossy quality) and Tidal HiFi (lossless CD quality - FLAC-based 16-Bit/44.1 kHz). Amazon launched its standalone music streaming service this morning. It's called Amazon Music Unlimited and it is available for $7.99 per month to Amazon Prime subscribers, or less than the $9.99 per month it costs to subscribe to Spotify's premium tier or Apple Music. The Amazon catalogue offers "tens of millions" of songs that contain the libraries of Sony, Universal, and Warner Brothers, with whom Amazon struck deals.